Situated dead centre on a map of Scotland, Kinloch Rannoch is near the end of a dead-end road and as such has a character all of its own. A great meet for newbies, there were 4 PNMs and 2 recent additions on the meet, and there was plenty of room to spread out in the outdoor centre, which was warm and comfy after some recent refurb work. Without a functioning telly (3 years ago on this meet this had been showing Sochi Winter Olympics back-to-back) we were forced to make conversation and eat all the chocs that Emma C had brought, and endlessly debate sensible local routes for windy snowy days! Emma C, David T and I basked in skewed weekend glory by leaving Edinburgh early on Friday and targeting the two middle Munros from Invervar (Glen Lyon). 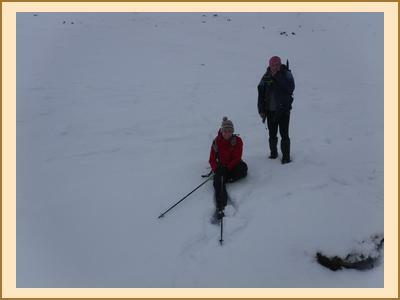 I led the way in snow shoes, in benign conditions to begin with, but we were knocked sideways by icy blasts while following the summit fenceline and after a rime-icy conflab at the top we opted to return via the outbound route. Emma will have to tick off the other one (on her 4th attempt) next time! As if on cue, virtually everyone else turned up in the 30 mins between 8.30 and 9pm, except newbie Thibault who had “made some bad decisions” in Edinburgh and didn’t turn up until 10. Saturday saw an approximately 50:50 split: I went with Tony, Emma C, Ned, Shireen and Thibault up the Corbett behind the outdoor centre. Using compass for most of the way and having to resort to GPS to find the summit in the white, we were actually able to have lunch and a chat in the lea of the huge cairn before descending to the glen and walking through woodlands back to the village. Kate, Allan, Alison F, Alexander and Emma went off in the direction of Farragon Hill but being attacked from all angles on Meall nan Tairneachan they chose the troglodyte life, lunched in a cave and returned along the track. The two groups met up in the café in Kinloch Rannoch. David T had an adventure on Creag a Mhadaidh – a Graham just a handful of km NW of our Corbett – and rather smugly declared that his walk had been clag-free. He did, however, have to follow a fresh trail of blood all the way back to the car, following the recent disposal of a local stag by an estate team. Tim also went rogue and bagged Carn Chreag and Beinn Dearg (Glen Lyon) which was hard work in deep snow on ascent but seemed to get easier higher up. 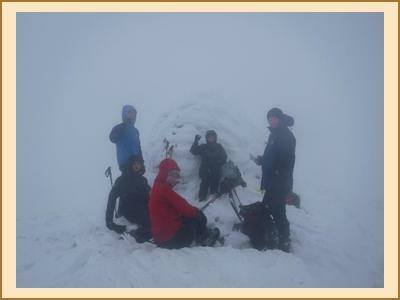 Several of us left on Saturday afternoon for various reasons; the reduced party on Sunday comprised an abortive attempt on Schiehallion by Tony, Ned, Shireen and Thibault; meanwhile Kate and Allan climbed Beinn a Chuallaich via the shorter east side. It was hard work and very windy on top but they got views from the summit and they were pleased, having had an abortive attempt last time. Tim, still with his Corbett bagging head on, did Meall nan Maigheach: a quick bag from a 500m start on the road from Glen Lyon to Loch Tay. He used the snow shoes, and was glad of them! Summer tyres on his car were insufficient to get him over the pass to Killin so he had a longer drive back to Edinburgh. Winter 2017-18: altogether more wintry than the whole of the 2016-17 season put together!